One day after Apple reported a disappointing 15% drop in iPhone sales, and just hours before Chinese Vice Premier Liu He was set to kick off high level trade talks in Washington, Taiwan-based Foxconn, one of the consumer-tech giant's largest suppliers, told Reuters that it is shelving plans to hire thousands of workers at its new plant in Wisconsin as it reconsiders plans to build LCD displays (Apple's most recent crop of iPhones uses these displays). Instead of the manufacturing workforce FoxConn promised when it received billions of dollars in tax breaks and state aide to build the $10 billion campus - the company, which has extensive operations in the PRC - said it instead plans to hire engineers and researchers. When Foxconn's investment was announced in 2017, President Trump praised it as evidence that manufacturing jobs would return to the US under his administration. The investment marked the largest greenfield investment by a foreign company in US history, according to Reuters. The company had initially planned to build LCD screens for TVs and other larger gadgets, but had more recently pivoting to building screens for "smaller products" like smartphones. While it's unclear whether these smartphone screens would have been used for Apple products, Foxconn is one of Apple's largest suppliers, and has been cutting back iPhone-related production at facilities in China because sales of the latest batch of iPhones has been slower than Apple had initially anticipated. "In terms of TV, we have no place in the U.S.," he said in an interview. "We can’t compete." Instead of building a "factory", Foxconn wants to instead focus on building a "technology hub". But suddenly, plans to hire as many as 13,000 workers are now in jeopardy. The company told Reuters that rather than manufacturing the LCD panels in the US, it would make more sense to produce them in greater China or Japan, ship them to Mexico for the finishing touches, then bring them into the US for assembly of the final product. 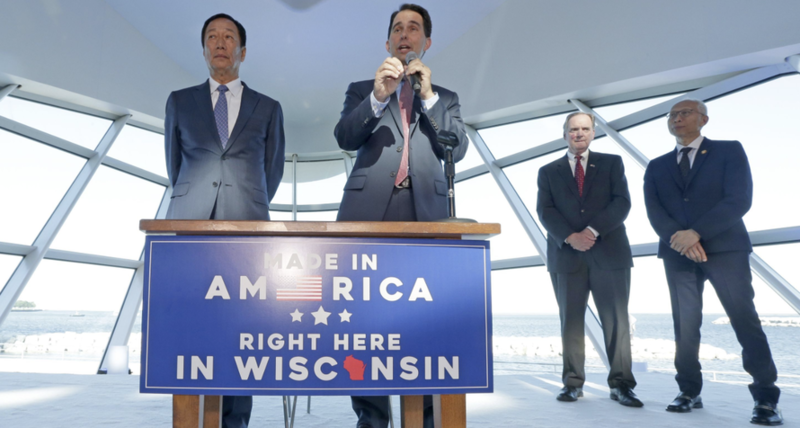 Rather than a focus on LCD manufacturing, Foxconn wants to create a "technology hub" in Wisconsin that would largely consist of research facilities along with packaging and assembly operations, Woo said. It would also produce specialized tech products for industrial, healthcare, and professional applications, he added. "In Wisconsin we’re not building a factory. You can’t use a factory to view our Wisconsin investment," Woo said. Earlier this month, Foxconn, a major supplier to Apple Inc., reiterated its intention to create 13,000 jobs in Wisconsin, but said it had slowed its pace of hiring. The company initially said it expected to employ about 5,200 people by the end of 2020; a company source said that figure now looks likely to be closer to 1,000 workers. And in another blow to former Gov Scott Walker, who negotiated the $4 billion in incentives provided to Foxconn, Democrats who had decried the giveaways as a bad deal for the state of Wisconsin can now say "I told you so." Foxconn had reiterated its commitment to hiring the workers as recently as earlier this month. But according to Reuters, its scaled-back plans could involve hiring as few as 1,000 workers. Foxconn Chief Executive Terry Gou plans to meet with Wisconsin's new Democratic Gov. Tony Evers to discuss "modifications" to the original deal (to qualify for its tax credits, Foxconn must meet certain hiring and investment goals). The timing of the reports certainly seems interesting, as Chinese companies pull money out of Silicon Valley and US real estate. And with trade talks with China entering there must critical stage, is this one more nudge to the Trump Administration that, if it doesn't play ball, Beijing won't hesitate to put the screws to companies that have a large presence in China? Or is it simply another sign that Apple - which has blamed slowing sales in part on the trade war - needs to cut prices?